Lease a new 2017 Hyundai Elantra GT for only $189 per month for 36 months! 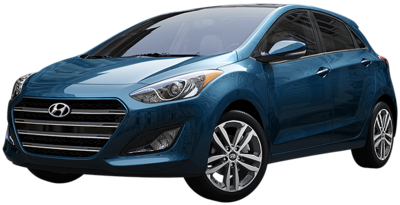 Lease a 2017 Elantra GT 5dr HB AT for $189 per month for 36 months with $1,499 due at lease signing. Closed end lease for 2017 Elantra GT 5dr HB AT (Model # D1522F45) available from 12/1/16 through 1/3/17, to well-qualified lessees approved by Hyundai Motor Finance. Not all lessees will qualify. Higher lease rates apply for lessees with lower credit ratings. Offer shown based on $1,499 due at lease signing (includes $189 first payment and $1,310 capitalized cost reduction). No security deposit required. MSRP $20,635 (includes destination, excludes tax, license, title, registration, documentation fees, options, insurance and the like). Actual net capitalized cost $16,661. Net capitalized cost includes $595 acquisition fee and includes credit for $500 Valued Owner Incentive or $500 Competitive Owner Incentive. Dealer contribution may vary and could affect actual lease payment. Total monthly payments $6,804. Option to purchase at lease end $10,524 Lessee is responsible for third-party fees. Third-party fees vary by state or locality. Lessee is also responsible for insurance, maintenance, repairs, $.20 per mile over 12,000 miles/year, excess wear, and a $400 disposition fee. Disposition fee of $400 applies in all states except in CO, IN, IA, KS, ME, OK, SC, WI, WV, & WY, where disposition fee is subject to state law limitations. Special Low 1.9% APR (up to 36 months) at $28.60 per $1,000 financed for qualified buyers. Special Low 1.9% APR (up to 48 months) at $21.65 per $1,000 financed for qualified buyers. 1.9% Annual Percentage Rate (APR) up to 60 months. 2.99% Annual Percentage Rate (APR) up to 72 months. APR financing available, subject to credit approval by Hyundai Motor Finance to very well qualified buyers and not available on balloon financing. Only a limited number of customers will qualify for advertised APR. Down payment will vary depending on APR. Bonus Cash must be applied as a down payment. Must take delivery from a participating dealer and from retail stock from December 1, 2016 - January 3, 2017. New vehicles only. This incentive is for a limited time offer on eligible Hyundai vehicles and may not be combined with other special offers except where specified. Dealer contribution may vary and could affect actual monthly payment. See your participating Hyundai dealer for more details on these special offers. Finance contract must be signed and dated no later than January 3, 2017. $1,500 Retail Bonus Cash available on all 2017 Hyundai Elantra GT vehicles purchased from dealer stock between December 1, 2016 and January 3, 2017. Customers who participate in a Special Lease or Low APR program through Hyundai Motor Finance (HMF) do not qualify for Retail Bonus Cash. See participating dealer for details. Offer ends January 3, 2017. If you are currently a registered owner of a vehicle distributed by Hyundai Motor America, you can receive an additional $500 off a new 2017 Hyundai Elantra GT. Offer cannot be combined with Competitive Coupon. If you are currently a registered owner of a qualifying competitive vehicle, you can receive an additional $500 off a new 2017 Hyundai Elantra GT. See your local dealer for program details and list of qualifying competitive vehicles. Offer cannot be combined with Valued Owner Coupon.